Is it safe to eat papaya in pregnancy? 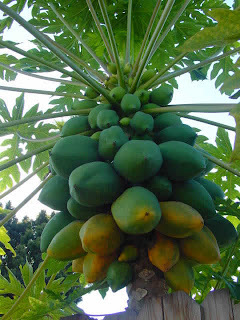 A common belief among peoples in most part of the world that eating papaya is dangerous while pregnant. Studies have found that the consumption of ripe papaya during pregnancy poses no significant danger while unripe or semi-ripe papaya could induce spasmodic contraction of the uterine muscles similar to oxytocin and prostaglandin F, harming the fetus. According to Ayurveda, the Kapha dosha is responsible for the stability and growth of the fetus. Unripe papaya reduces Kapha and enhances Vata and Pitha, and hence is harmful to pregnancy, especially in earlier stages. Unripe papaya, rich with pungent properties, could act as an emmenagogue(herbs which stimulate blood flow in the pelvic area and uterus; some stimulate menstruation), and induce bleeding. This could cause abortion. The pungent properties have systemic effect of an anticoagulant. The penetrative property found in seeds and latex also provokes bleeding, making unripe papaya, which has a lot of latex, an emmengogue. (However, the same property makes it effective against amenorrhoea which is the absence of a menstrual period). However, consumption of papaya enhances production of breast milk and hence it can be given to nursing mothers as salad or juice. It can also be given to a mother who is debilitated due to labour. The recommended quantity is 100-150ml of the juice once in two days. It also helps purify breast milk during lactation.